I LOVE a good set of baby cosmetics! And, as you have probably gathered by now, I'm a huge fan of organic and natural cosmetics in the first instance, especially for young skin. 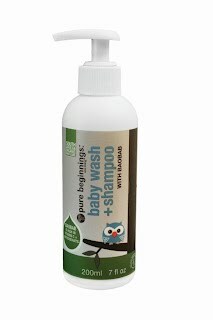 Eco shopping website Big Green Smile is just my kind of website and they asked Holly (and me) to review one of their new ranges of baby skincare products - Pure Beginnings. Pure Beginnings is a family business from South Africa who make organic and natural cosmetics for babies. Pure Beginnings specialise combine herbal botanical ingredients with plant ingredients, many of which are unique to Africa. They also pride themselves on the fact that they contribute to the welfare of South Africa's rural communities and protect its biodiversity. Our favourite product from the range was the Pure Beginnings Baby Bum Cream which has a self-explanatory name! We don't use a lot of nappy cream (no need if you have good cloth nappies!) but in the warm weather the nappies have become a bit clammy and Holly has needed a barrier cream applied. The cream is a really nice buttery texture - not too runny, not too thick and, when I apply it, it makes a visible barrier on the skin. The Pure Beginnings baby bum cream contains baobab extract which improves skin elasticity and is packed full of anti-oxidants. It also contains olive, lavender and tea tree oil which make the cream naturally anti-fungal, anti-bacterial and anti-viral; It can also be used to soothe insect bites and stings as baobab has anti-inflammatory properties. The scent of the cream is really floral - to me it is the organic geranium oil that is most distinctive in its scent. On Lara I have tried out the Pure Beginnings Baby Lotion to soothe her dry skin on her arms and legs. It smells divine, the same rose hint. Baobab is also a key ingredient in the baby lotion along with moisturising shea butter. It is lovely to apply and having also used it on myself, I can vouch for the fact that it is both refreshing and soothing. Also in the range is a two-in-one baby bath and shampoo. I haven't yet used anything other than water on Holly's skin in the bath (a lesson I learned from last time was not to introduce cleansers to the skin too early in life) but for Lara, the shampoo seems to be a success. Once again, I've fallen in love with this product for its scent - the organic rose geranium oil is such a summery smell and leaves Lara smelling scrumptious! Baobab and rosemary are also key ingredients in this body wash and shampoo. It seems like a good all-round baby product and I look forward to using it on Holly in the coming months. Big Green Smile also sell the toothpaste and bubble bath from the Pure Beginnings range for slightly older children than Holly.